Dosage Under 25lbs: 3-4 drops in each ear, 25-50lbs: 1/2 dropper in each ear, Over 50lbs: 3/4 dropper in each ear. Contraindications Not for internal use. Discontinue if ear appears more red or aggravated after application. This may indicate an allergic reaction. Ear Care Gold is a home treatment for your dog's ears. The ingredients in Ear Care Gold provide an inhospitable environment to yeast, bacteria and fungi, yet are gentle and soothing to the ears. This product will help to leave the skin inside the ear normal and healthy. 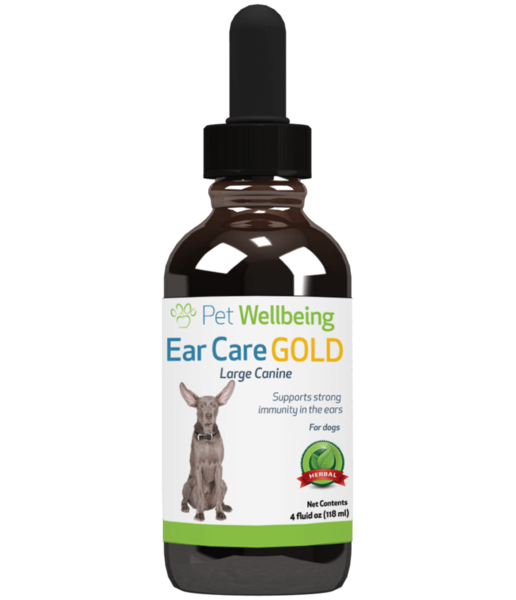 Designed by our holistic veterinarians, Ear Care Gold is an infused herbal oil, made with potent herbs for dealing with common ear discomfort experienced by many dogs. The base of this product is MCT (medium chain triglyceride) oil. Unlike regular coconut oil, this oil remains in a liquid state at room temperature. This oil is known for its ability to keep skin tissue healthy and provide nutrition to the layers of the skin. Furthermore, the oil helps to maintain the natural immunity of the skin, assisting the skin's barrier capability often needed by canines prone to ear problems. Base: MCT (Medium Chain Triglyceride) Oil: This oil has the ability on its own, to effectively clean and support the daily health of the ears. It gently loosens wax and debris. MCT oil is made up of medium chain fatty acids, similar to the wax normally created inside the ear. It also enhances the ears' natural immunity to harmful bacteria, viruses and yeast.